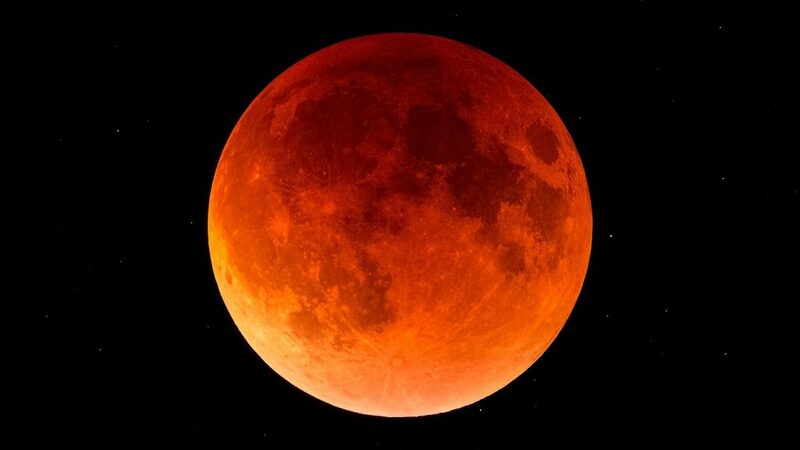 I am sure you have heard there will be a total lunar eclipse on the evening of the 20th and morning of the 21st. Unlike a total solar eclipse when a precise alignment causes the moon’s shadow to fall on the Earth, a lunar eclipse is a more common occurrence when the Earth’s shadow covers a portion or all of the moon. This particular eclipse will start late Sunday night with totality visible from about 12:41 AM on Monday and lasting over an hour until 1:44 AM. Also unlike a solar eclipse, a lunar eclipse is a lengthy affair. The first signs of the eclipse should be visible at 11:10 PM Sunday and the final phase at 3:15 AM on Monday. The weather forecast for Balsam is iffy with a cold front pushing through and clearing out the weekend rain showers. Check the forecast on Dogstar’s weather link and bundle up if the weather cooperates. If the weather clears you should see a ‘blood moon’ which is caused by sunlight filtered by the Earth’s atmosphere illuminating the lunar surface.